Beginning in February this year, we undertook a massive project – renovating an entire house. Part of these renovations included knocking through the boxy kitchen and dining room ajoining wall, and building a ground floor extension, creating one big space for cooking, eating, lounging, and playing. There have been glimpses here and there on Instagram and in my videos, but I’ve yet to actually blog about any of our renovations. It’s partly because I need to piece together a mammoth amount of footage taken on different devices over a period of several months to create the grand “before and after” video that I’m planning. It’s also partly because I felt I should keep each room under wraps until it’s completely finished and ready to reveal. I’ve since realised that this is completely redundant, seeing as we are unlikely to ever have a completely finished space – we take things very slowly when it comes to home improvement, and our decor is always adapting. Plus, it wouldn’t really feel very true to life to suddenly go from the before to the after, without documenting the painstaking in-between. So, here is our kitchen as it was, and as it currently is. This was a quick snap I took of the kitchen on the day we moved in. This was the temporary kitchen that we lived with for several months during the renovation. And this is our kitchen after the extension, on the day the worktops were installed. And finally, here is our kitchen in it’s current, lived-in state. It’s entirely unrecognisable from how it was when we first moved in, and looking back is a nice reminder of how far we’ve come with our renovations. Sometimes, in the world of house renovation, it can feel like things have stalled or that not much has happened in a while. We are usually waiting on something, or planning the next step. But actually, we’ve achieved a hell of a lot in the last half a year as a whole. As our kitchen is part of a bigger room encompassing a dining area and living/play area too, we wanted the kitchen design and colours to blend into the surroundings rather than stand out too much. Our family room is a bright, light, and airy space and I wanted our kitchen design to reflect that. 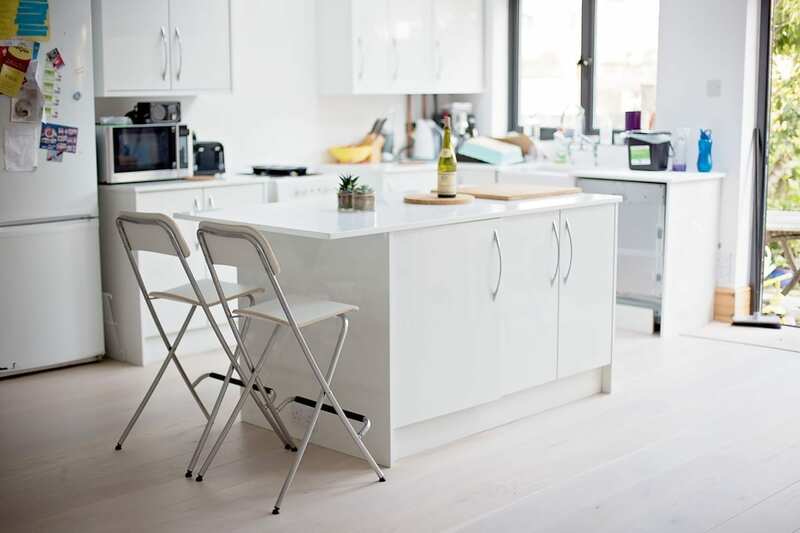 I think our modern white kitchen does this very well, and I think the marble and wood effect that I had originally been lusting after would have felt a little heavy and out of place in comparison. We built a space for a range cooker, which isn’t purchased yet. And the dishwasher door is going to be put on this week. The kitchen is from Wickes and the worktops are quartz and were bought from a separate supplier. Our reasons for choosing the things we did probably deserves a dedicated post, so I will write more about that later. Lots of people ask about our cage lights. We google imaged geometric pendant lights and bought the cheapest ones that came up. They were around £27 each I think. We bought them thinking we might replace them later if we find something we really LOVE, but didn’t want to spend much money to begin with as when you times it by 3 pendants, it all starts adding up very quickly. At the moment, we have kitchen appliances firmly on our minds, which is why we were really interested to go along to the Beko Tea Party at Maggie and Rose last weekend, where Beko were showcasing their latest appliances. It was a rare, but lovely thing, to have the entire Sorry About The Mess family, including Sam, come along to a blog event with me. It was a really nice, family event, and it was a lovely surprise to see fellow blogging friend Donna from What The Redhead Said and catch up with her. We left a big space in our kitchen design for an American style fridge freezer, and a utility area. You can’t see it in these photos, but it’s just beyond where our current fridge is now, where our clutter corner of doom currently resides. The eventual plan being to hide the laundry and storage area behind big floor to ceiling doors. Our current fridge freezer now feels glaringly out of place to me, and I can’t wait to update it with something more modern to suit our new kitchen. Most of Beko’s American style fridge freezers come in both chrome and black, and given our monochrome kitchen colour scheme, I think a black one would look very smart in our new space. I also would really really love a separate washing machine and tumble dryer. We currently have a combined washer/dryer, as there wasn’t room for two separate machines in our old house. But this means I can’t have one load washing and one load drying at the same time, and the drying cycle on a washer/dryer is less efficient and quick than one on a dedicated dryer. We have space in our new kitchen for both appliances (hurrah! ), and are just biding our time until we have the budget for them. One appliance that we did prioritise was a dishwasher. We’ve never had a dishwasher before, there wasn’t the space for one in our old house, and it’s turned out to be pretty life-changing. Our dishwasher is also from Beko, and we bought it mainly for the little red indicator light that shines on the floor to tell you when it’s in use, as with integrated dishwashers it can be hard to know when the cycle has finished and it’s safe to open the door. There are still a fair few smaller jobs left to do in our kitchen before it’s finished. There are some boiler pipes that need boxing in, a window sill to install, a range cooker to be bought, adding an extra piece to the under sink cupboard, and the tiling to be done. There are various boring reasons for the order at which these last few jobs need to be done, but they all centre around the range cooker, which we are not in a position to afford just yet. When we realised the renovation funds were going to run dry, we decided a functional kitchen was the important thing, with the finishing decor touches and new appliances being a focus for later down the track. Renovating a kitchen is not a quick and magical transformation. It involves a fair amount of budgeting, waiting, and very boring decision-making. It also takes time when you stop to have a baby mid-renovation. But we are so excited about the space we’ve been able to create, and are happy to take our renovations at a slower pace, in the meantime just enjoying family life in our new house. I’d love to know what you think of our kitchen so far, and what you think we should do tile-wise? Keep them white like the rest of the kitchen? Go for subway tiling, or perhaps something a little different? Looking great! I too agree a dishwasher is life changing, I wouldn’t live without one. We have a similar overhang by the way on our kitchen work top. Something I insisted we have… and now never use as our dining table is two meters away ha ha. Looks like yours is used though! Haha yes, the kids use the island bar to eat breakfast and dinner, dining table is now reserved for family meals but mostly my washing pile. Love it!! Looks so nice and clean! I think you should pick tiling that is easy to clean and hides dirt:) yes I’m a mom, can you tell by my tiling preference? Hiding dirt is definitely an important factor! I love it, what a lovely open space for you and your family to enjoy! I think tile-wise either a grey subway tile or white subway tile with grey grout. I can’t wait to see it when it’s 100% finished! I would love to do white subway with white grout like in our bathroom, but not sure white grout is practical in a kitchen so maybe you are right about a grey grout! Have also been considering a grey tile but not sure if that will take away too much of the whiteness of the kitchen? Hmmm. The truth is we will NEVER be tidy enough to not have a bit of ‘lived-in’ evidence in any photo. I like that you picked up on that though, as one of our main thoughts throughout the design process was that this will be a well-used family kitchen, and the design and ‘usability’ needed to reflect that. I love the industrial look – we toyed with doing some exposed brick at the point the walls were coming down and plaster coming off anyway, but it wouldn’t have worked in the kitchen as that wall is part of the extension so it’s all new ugly grey brick. Wow the change is incredible and I love the white and all the light! I have serious intentions that our next house will have a dishwasher – there’s never been room for one in our current house either and it would be bliss!! It’s so tough when you are a family of five with no dishwasher. No matter what, there was ALWAYS a pile of washing up waiting for me in the pre-dishwasher days. Hope you finally get one! I am so insanley jealous of your beautiful kitchen in comparison to mine right now. What a gorgeous kitchen! Love it. We are currently doing something very similar and wondered if you would share your worktop supplier (by email if you prefer) as we are wondering whether to get a separate supplier for the worktop. Also do you find it stains at all? Oh my questions are so interesting!! All very important questions! We spent a long time deliberating over which worktops and colour to get. We got our worktops from a local Croydon supplier, but the brand is cimstone. It was the nearest white to our kitchen cabinets (turns out there are a LOT of shades of white!) We are pretty paranoid about stains seeing as it is pure white. So far, everything has wiped off, and we cook a LOT using things lke turmeric so it’s standing up well. The trick is to wipe stains as soon as possible, don’t let anything sit for too long. I’m planning to blog specifcally about the worktops at some point because it was one of our biggest and most lengthy decisions.